After his latest triumph at the Phillip II stadium in Skopje, Zinedine Zidane is making history as coach of Real Madrid following his illustrious playing career with the club. In less than two years, the Frenchman has already written his name in the team’s glorious record-books following the capture of six titles, which makes him the fourth best in Los Blancos history. With two Champions League titles, two European Super Cups, one LaLiga and a Club World Cup, he is just one achievement away from Vicente del Bosque who has seven trophies. 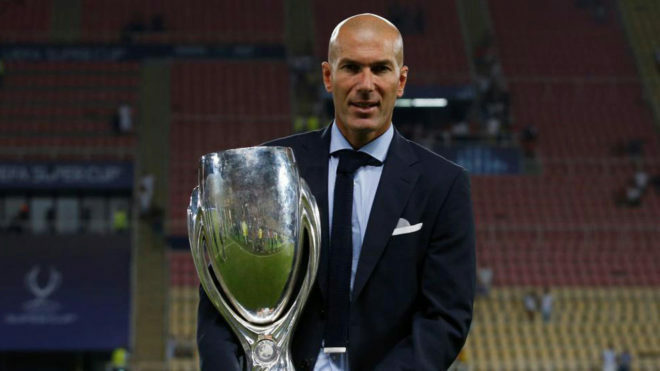 Furthermore, the 45-year-old is only two away from Luis Molowny’s accomplishments and a little further away from Miguel Munoz who boasts an impressive 14, yet Zidane’s journey at the Estadio Santiago Bernabeu is just beginning. Amongst other feats, the former World Cup winner is only the second coach to win the European Super Cup in two consecutive seasons, following Arrigo Sacchi in 1990.